Here you will find a collection of stories from the world of the honey bee – both past and present. The site’s main purpose is to act as a place to gather the stories from the folklore and ancient myth associated with bees – Beelore will guide you to some of these stories. Bees also have a magical, other-worldly quality about them – and Beetwixt and Beetween covers stories that are perhaps a little mystical, magical or downright unexplainable. There are also some natural Laws that the bees follow – probably not even knowing they are laws! You will find them under Bee Law. As well as my interest in bee lore, I also find real inspiration from the bees in the present. Keeping them; studying them; harvesting honey from them. Even the name “bee” has such present and direct assocation with the command “BE”! Bee in the present! or Bee in the Now – which is surely one of the basic principles of all religions worldwide. Bee Present will take you to these stories. I hope that my reflections on bees and life will be interesting both to those of you who know me and those who do not. I also hope that they are also interesting (and reasonably accurate) for the odd beekeeper who ventures onto the site! As a fellow beekeeper, I have classified some under Beekeeping and here I keep a blog for my beekeeping persuits. I know that that bees don’t read – particularly the many books that have been written about their behaviour. But if a bee did take up reading, I hope it would also find the site interesting! There are also a few stories on the biology of the bee – which I have put under the Beeology label. For those who find inaccuracies in any of the details above or who want to reflect on their own ideas and suggestions – or even steer one of the storylines, please feel free to leave a comment or two! Although this site looks like a “blog” – but isn’t only a blog. It is really the cross between a blog and a book. There is one BEELINE (or Tag) which is better read from the bottom upwards…..or back to front. It will make more sense then! The line for this story is Bylaugh – which is where my fascination for the honeybee all started. So this particular line is a storybook in its own right. If there are any would-be publishers who like the Bylaugh Storyline – please also get in touch with me on the form below! We used to have a picture at the top of the blook from detail from “Metamorphose II”, a woodcut in three colours by Maurits Cornelis Escher (1898 – 1972). Between 1938 and 1940 Escher created a thirteen foot “woodcut strip” called “Metamorphose II” which shows a gradual progression of transformation. The woodcut was in black, green and brown, printed from twenty-three blocks on three combined sheets. The word “metamorphose” becomes a springboard for the images. The segment shown was the piece moving from hexagons to cells of a honeycomb to bee larvae to young bees hatching to a bee flying! What a dynamic picture in such a small space! We now have a picture of honeycomb with freshly laid eggs from the Queen – in anticipation of Spring and a new year of bees born in the hive! Love it! Hope they have survived and thrived over the past few years! 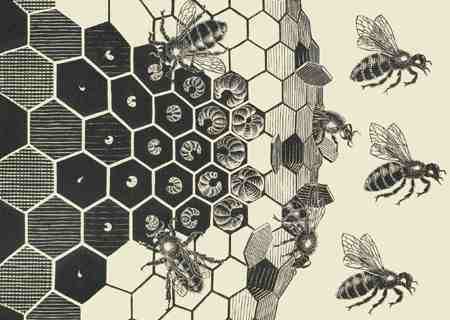 Bee Lore is one of the most remarkable blogs about bees I have come across so far. I love to get lost in all your stories! Very inspiring. Also, I very much admire the header picture you have chosen. Well done, Mr. Escher. Thank you, Bee Lore! Yes I can help. If you have not found anyone else, then please write back and I can give you an hour or so at my apiary which is quite close by. Hi Alison – did you ever start beekeeping? Thank you so much, Ceilla! I have finally got enough honey in the hive to start to write more of the Blook – so watch this space! What do you think of HU man BEEing? Why not, Deborah!. Did you know your name means “bee” in Hebrew?